Offer you an easy to learn and use the system on interior design and furniture, which opens opportunities design and visualization of creative ideas: for professionals and for those who want to do their own decor. With this program you can quickly create any interior and bring it to perfection, filling pieces of furniture from the disc provided by an extensive catalog of 3D-objects, libraries, materials and textures or self-designing the necessary details. The program allows you to create and print photo-realistic images of the interior size and accompanying text. * The construction plans of any configuration settings with accurate dimensions. * Free Transform objects moving along the axes - arbitrarily and at a predetermined distance. * Curve Editor - the exact construction of curved and rectangular shapes to create the interior design and furniture design. * Catalog of 3D-objects and materials with the possibility of editing and expanding. * Design of openings, doors, windows and balcony blocks. * Creation of light sources of different configurations. * Printing images of the interior and plans. Catching arrangement of furniture in the apartment after renovation, new home or simply out of a desire to change the situation, we often visualize several options. In some cases, these options are reflected on a sheet of paper. But if you want to really competently, to the nearest centimeter option to calculate the interior, as well as see firsthand how it will look your bedroom, living room or kitchen, it is better to use special applications. Covershenno not sure it should be a specialized CAD software, which use without special training is not easy. All the more common three-dimensional modeling of the interior, which are available to people with virtually any level of computer training. They only require a set size of the room and place within them all the necessary facilities. Then, in three-dimensional form can look at the result, after experimenting with different light sources and objects. The program DS 3D Interior 4.0 just assigned to this classification. You can use it to simulate any environment, from the choice of colors and textures of the floor, ceiling and walls and finishing with potted plants and paintings on the walls. Requires the user to select the desired three-dimensional objects from a special directory (kitchen, office, bedroom, living room) and drag them to the main window. At the same time in the appropriate boxes are drawings frontal sections (front view) and plan (top view). Objects can be moved, change their shape and size, group them and perform operations on groups. Objects rigidly positioned relative to each other thanks to the bindings. Paste can be not only furniture but also doors, windows and balcony blocks. The program allows you to add text to the project and set sizes. There is a mode specification that reflects all items used in the project. If the user is not enough available in the catalog of standard items, you can create something of their own. The fact that the program has a multi-curve editor, with which you can design your own furniture and interior design model. Interestingly implemented to work with light sources. If you add to the project a real source, such as a table lamp or floor lamp, the interior can be seen in this light source. Available as an option and the virtual source color. Virtual sources can be of several types - spot, spotlight or directional light. Finished projects can be rendered, saved as a BMP. User to the ready-made examples of projects created in DS 3D Interior 4.0 and their variants format BMP. 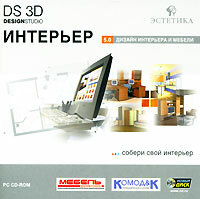 Download DS 3D Instructor 5.0, you can immediately after the payment.